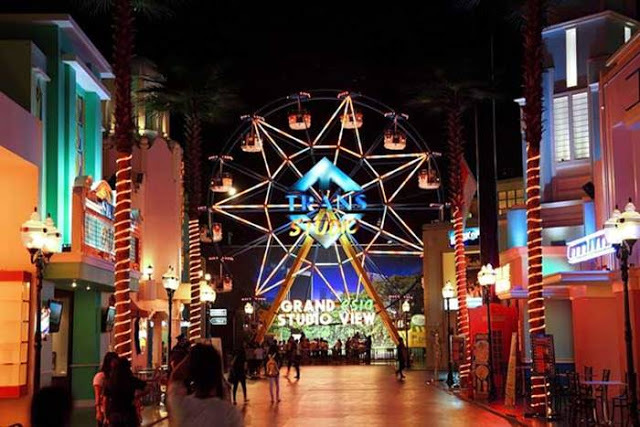 Trans Studio Makassar is the second largest indoor amusement park in Indonesia after the Trans Studio Bandung. On an area of 2.7 hectares, Trans Studio Theme Park presents the 22 rides and various forms of entertainment that available in 4 regions with different and unique themes. The visitors can feel how to be a star in front of the camera as well as a person behind the screen from favorite shows in Trans TV and Trans 7. Trans Studio is located on the main road of Metro Tanjung Bunga Street, Makassar. This amusement park is able to hold 5,000 people and it developed under the management of PT. Trans Kalla, a partnership between Para Group and Kalla Group. Chairul Tanjung, the founder and the owner of Para Group, is the number 18th richest Indonesian businessman. He owns Bank Mega and television broadcasting company, Trans Corp. In fact, Trans Corp, who operates private television stations Trans Tv and TV7, is the first television station ever to own an indoor theme park. On the other hand, Kalla Groups is owned by Jusuf Kalla, Vice President of Indonesia. Together, Chairul Tanjung and Jusuf Kalla created PT. Trans Kalla in 2007. The theme park consists of 22 features and amusement rides including Central Studio, Lost City, Magic Corner, Tsunami Island and Cartoon City. Many of the rides in Trans Studio are adopted from TransTV's and Trans7's shows such as Dunia Lain, Si Bolang, Jelajah, Ayun Ombak, and Angin Beliung; yet, some of them are adopted from Universal Studios and Disneyland in the United States. The rides also contain space simulation program of several television stations such as Trans TV, Trans 7, and other events in Indonesia. One ride that is pretty unusual is "Dunia Lain", tranlated by "Another World". It is an Indonesian style haunted house with different kinds of Indonesian ghosts such as kuntilanak and jelangkung. Moreover, there is a Studio Central, an extraordinary theater with 1960s theme, providing the visitors the glamor world of Hollywood; the zone reveals tricks and secrets behind the scenes of great movies.